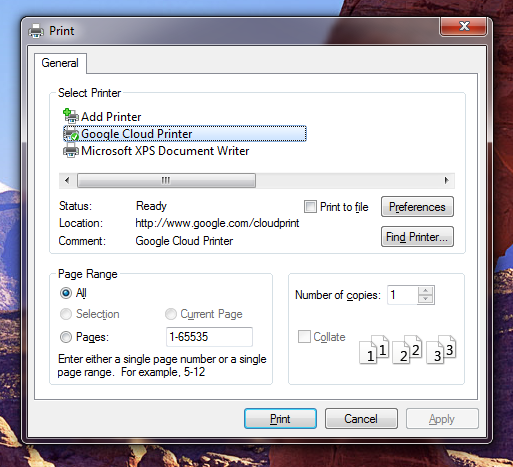 Google today launched its Cloud Printer driver and service for Windows allowing users to print documents outside Chrome. You can download either of them – the Cloud Printer driver and service – from Cloud Print Driver and Cloud Print Service directly. If in case you don’t know, Google Print lets you connect any Cloud Print applications to any printer across the web, desktop and mobile while the service is already integrated with the Gmail and Google Docs mobile versions already. The Google Cloud Printer lets you print any of your cloud printers from any of Windows applications out there, while the Google Cloud Print Service runs as a Windows Service which makes easy for administrators to connect existing printers to Google Cloud Print in their businesses and schools.